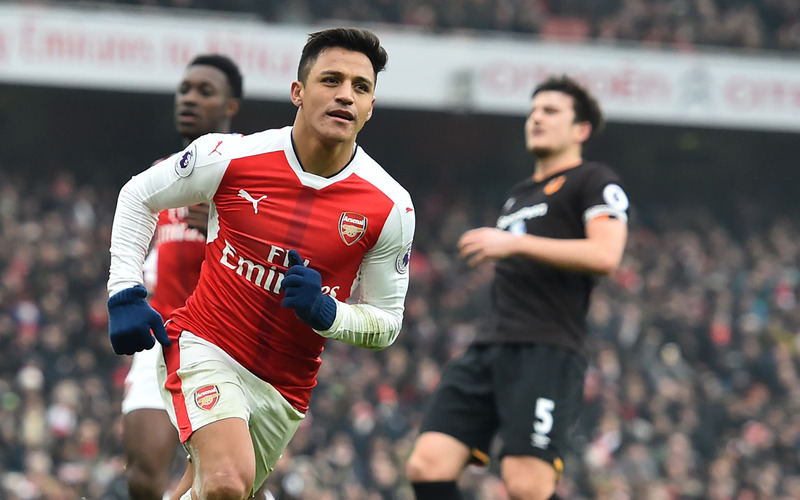 Alexis Sanchez struck twice as Arsenal returned to winning ways with a contentious and hard-fought 2-0 Premier League win over Hull City on Saturday. 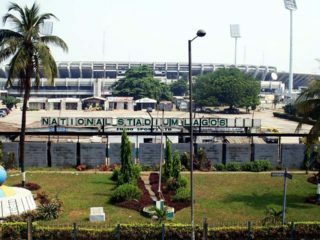 The Gunners had lost their last two games coming into this contest against the relegation-threatened Tigers and had drifted out of the title race as a result. They were by no means back to their best, but with a Champions League tie at Bayern Munich to come on Wednesday, manager Arsene Wenger will be pleased to have chalked up a timely victory. Sanchez opened the scoring on 34 minutes with a goal that was allowed to stand despite the ball going in off his right hand. He confirmed the three points with an injury-time penalty — his 17th goal of the campaign — after Sam Clucas had been sent off for clearing Lucas Perez’s strike off the line with his arm. Hull threatened on occasion, but failed to get a positive result to lift them out of the bottom three, while Arsenal stay in the top four and provisionally close to within nine points of leaders Chelsea. Some Arsenal fans decided to stay away in protest at what they deem as another failing Arsenal title bid. But one man taking his seat in the stands at the Emirates Stadium was the under-fire Wenger, who served the last game of his four-match touchline ban. His side seemed nervy at the back in the opening exchanges and Liverpool loanee Lazar Markovic broke into their box all too easily, but Oumar Niasse was unable to make contact with the Serbian’s cross. Niasse tested Petr Cech moments later as he got onto the end of Kamil Grosicki’s smart cross to head towards goal, forcing the Arsenal goalkeeper to tip his effort behind. 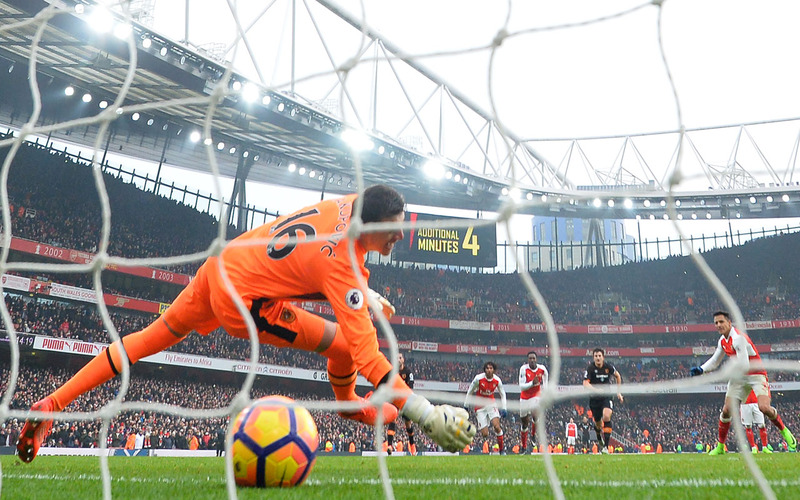 The hosts then passed up two glorious opportunities to take the lead, with Hector Bellerin lashing wide when well-placed and Sanchez pulling his own effort wide of the mark from the centre of goal. Hull’s defences were finally breached 10 minutes before the break and even then, the goal came in controversial circumstances. 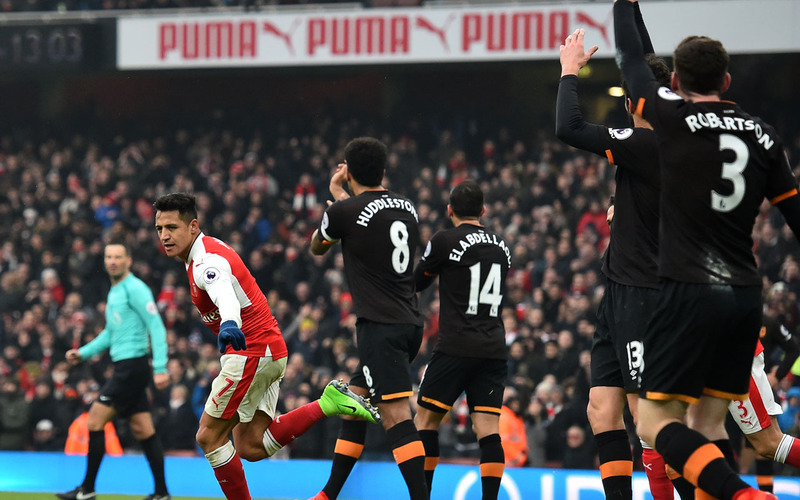 After Kieran Gibbs’s shot was scrambled off the line by Andy Robertson, Sanchez followed in with a shot that struck Hull goalkeeper Eldin Jakupovic before rebounding into the net off the Chilean’s hand. Despite protestations from the Hull players, the goal was given after assistant Jake Collin appeared to have a discussion with referee Mark Clattenburg over the incident. 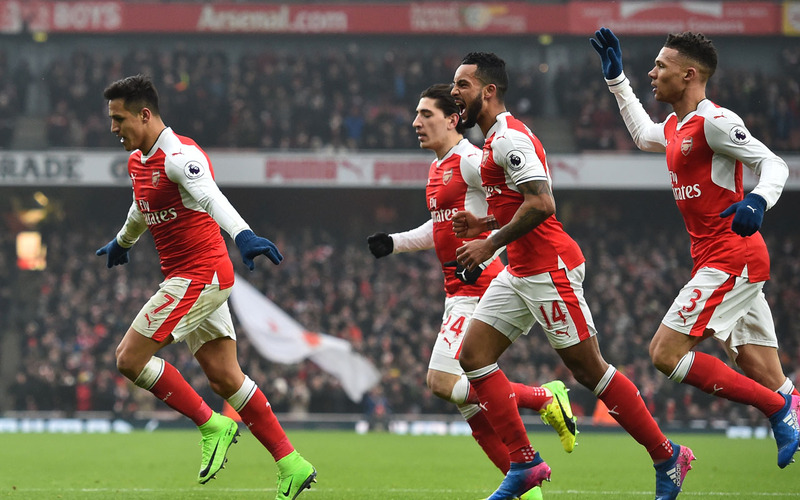 Arsenal survived an injury scare to Francis Coquelin early in the second half before Cech once again saved from Niasse. Theo Walcott was then cautioned for squaring up to Harry McGuire, with England colleague Gibbs lucky to only see yellow moments later for barging over Markovic as he ran through on goal. Alex Iwobi shot over after a neat exchange of passes with Ozil before Walcott fluffed his lines as he searched for his 100th goal in Arsenal colours. 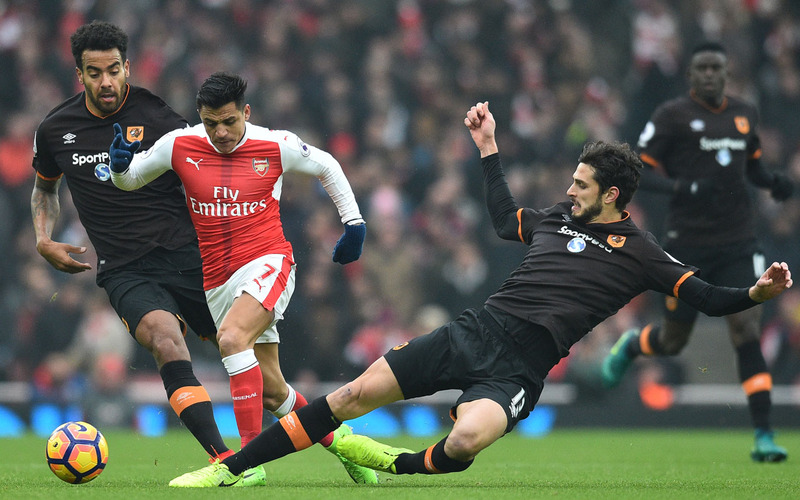 Niasse sent a header into the side-netting as Hull looked to ruin another weekend for Arsenal, who had Sanchez booked for simulation late on. Wenger looked to his bench in an attempt to build on his side’s slender lead, with both Danny Welbeck and Lucas coming on with 10 minutes remaining. Hull manager Marco Silva, who has now faced Chelsea, Manchester United, Liverpool and Arsenal since arriving at the KCOM Stadium, saw his own substitute Adama Diomande head a corner over. The game was sewn up in injury time after Perez saw his header blocked on the line by Clucas, who was trudging down the tunnel after being dismissed by Clattenburg as Sanchez tucked away the penalty to seal the win.